Down to Earth Inc. is a company that promotes earth-bag housing construction in Uganda as a means to foster sustainable housing construction through the use of the earth's most abundant building material; natural soil. With the ever-growing human population on earth, natural resources are being depleted at an unprecedented rate that threatens life itself. The Down to Earth Inc. action is to make a modest contribution to saving the planet through provision of construction techniques and solutions that encourage sustainable use of natural resources. Our activities include consultation, design, construction and the sale of materials used in earthbag construction and other alternative building systems that we support. Earth-bag construction is an exciting way to build a home out of natural earth. 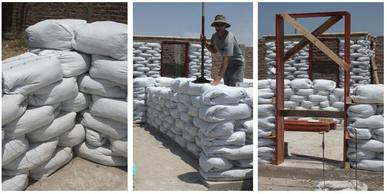 Earth-bag construction is so easy that a Do-it-yourself builder can build a complete house without much help from a professional building crew, making it possible to cut down costs without compromising on quality and strength of the house. Polypropylene bags are filled with soil and stacked like bricks. In building with earth, the bags provide the form for the earth and are a little more user friendly than the wooden forms normally used in rammed earth buildings. Rammed earth also requires a more specific mix of soil and clay than the soils that go into earth-bags, so it's easier to use on-site soil in earth-bag building. At the same time earth-bag construction is less labor intensive and faster to build with than unburnt soil or clay brick constructions because the bags are filled on site and used instantly without need for drying or firing. Earth bags are also a significant way to save dwindling forest resources. We are convinced that earthbag construction is the technology of the future and that is why we are promoting it.